Guys, I feel like crap. I got body aches fever and chills. i’ve been trying to heal all day yesterday but while the meds helped with the symptoms they did nothing for the infection. So today rather than going to work and coming home to pack for my trip to Atlanta this weekend, I have to tell work I won’t be coming in so I can rest and heal which will use PTO I didn’t want to use. I got into a doc at 10 to get some antibiotics so that should help and hopefully i’m better this afternoon. So what about you all? 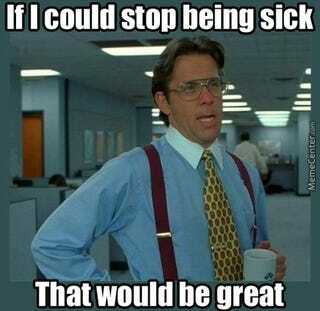 Anyone else under the weather today? If not then talk about whatever you want.